Small 4 Style: Back to School Beauty Night at Mockingbird Station! Back to School Beauty Night at Mockingbird Station! Ready for a night of pampering for back to school? 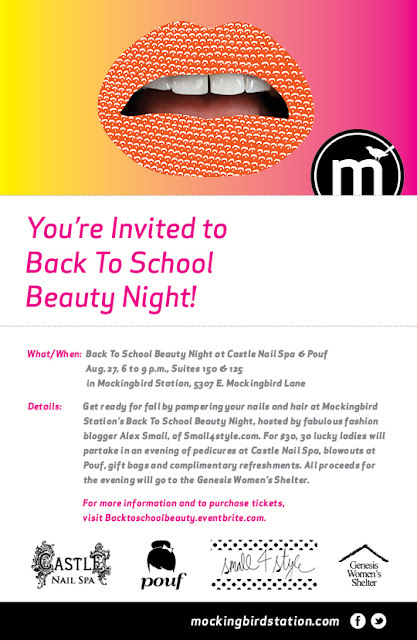 I'm hosting Mockingbird Station's Back to School Beauty Night and I couldn't be more excited. Your $30 ticket gets you a pedicure, a blowout, gift bag, and bites. The money raised from the tickets will benefit the Genesis Women's Shelter, which helps battered women and their children.